If you've ever had a sourdough starter, you know that it has to be maintained--replenished and either used or discarded--every week or so. I've been making a sourdough coffee cake, but last week I was looking for something different ... preferably a recipe that would use some overripe bananas. A quick web search yielded this recipe for sourdough banana bread, which was a big hit with my family! 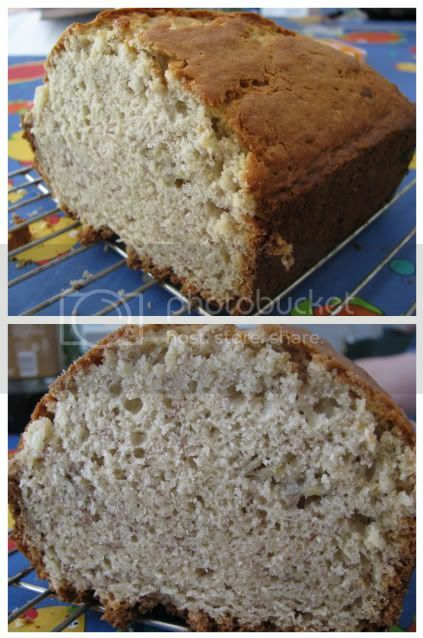 In comparison to standard banana bread, we found that this is somewhat less moist, less dense, and less sweet. It has a milder banana flavor. I omitted the walnuts, but I think they'd be a good addition. This is an outstanding sourdough banana bread that I would like to pass on. This came from Don and Myrtle Holm's Sourdough Cookbook in 1972. I have used it many times with excellent results. Cream together the shortening and sugar, add egg, and mix until blended. Stir in bananas and sourdough starter. Add orange rind or vanilla. Sift flour, measure again with salt, baking powder, and soda. Add flour mixture and walnuts to the first mixture, stirring just until blended. Pour into greased 9x5" loaf pan. Bake in moderate or 350 degree oven for 1 hour or until toothpick comes out clean. Cool before slicing. We liked this bread warm and, the next day, at room temperature with a little cream cheese. Yum! Mmmm - love banana bread. You know, I have none done a sourdough starter but I have done the Friendship Bread thing. Is that the same a sourdough? lol, because with all your yummy posts, i would be cooking all the time... and not blogging! Just kidding! I am going to have to put this in my to try to attempt one day pile! Oh that sounds so good! I love Sourdough bread!!! I haven't ever tried sough dough banana bread. Sounds yummy! I've been contemplating trying my hand at baking my own bread. This recipe looks like a good starter. My kids love bananas! What a yummy variety! Thanks so much for sharing and linkin up for tasty tuesdays! What a great idea! Your banana bread looks delicious! Hmmm.. ya know.. I can't remember if I used a already made crust or not? It was Christimas '08 that I made it. Wow,that is bad huh? I am pretty sure I did use a pre-made pie crust! hahahaha had a blonde moment there lol sorry!! Sounds fabulous!! It is now in my recipe database!! I have never heard of sourdough banana bread until now but I gotta say I love banana bread and sourdough bread so I'm really excited to try this. The cream cheese sounds soooo good on it too! I'm also glad to find a sourdough starter recipe. Hope you don't mind but I decided to link up with my Wonton Dumplings. Hello Meissa! This is an awesome Sourdough Banana Bread recipe. I will definitely make this over the weekend. Thanks for sharing. If you wont mind I'd love to guide Foodista readers to your post. Just add the foodista widget to the end of this post so it will appear in the Foodista pages and it's all set, Thanks! Loved the recipe will try making it at home someday! thanks for posting it! This looks interesting! I think my husband would like it because he loves sourdough bread.